Sweet Bursaria - A story of intimacy, trust and protection. It was one of those windless nights in late September, the crisp spring air cloaking us in almost total darkness. A soft yellow light from the torch revealed our exhaled breath adding to the prickle of excitement and our own sense of vulnerability. 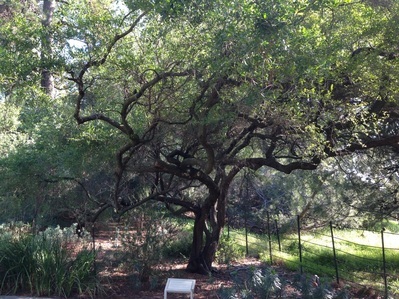 We were standing on one of the few flat areas in an undulating woodland of ghostly white trunks and shadowy shrubs. An almost inaudible whisper of "there" broke the silence and a finger pointed to a place at the edge of the darkness, a place that was about to reveal one of nature's most remarkable and very intimate relationships of trust and protection. From a small hole at the base of the tree emerged the advance party of tiny black-brown ants guiding a small caterpillar onto the trunk of a prickly shrub, rather like a group of small children leading the family milking cow onto a grassy meadow. This scene gives us a glimpse into a story of symbiosis involving a plant, a species of ant and a species of butterfly. Symbiosis means that there is a relationship of interdependence and cooperation and in many cases trust between different species. In human society we might describe it as 'give and take' for the benefit of both parties. Other words for symbiosis in society are partnership, friendship and support. It's easy to imaging our social structure falling apart if we didn't have these important nurturing relationships. In a similar way the natural world couldn't function without one organism supporting another while getting some benefit in return. Symbiotic relationships in nature between two life forms are common but a three way symbiosis between a plant, a tiny ant and a soft squishy grub many times its size seems unlikely, yet it is a relationship that has endured for thousands of years. The small group of young scientists stood in astonished wonder as more and more caterpillars were lead onto the prickly shrub. They were here on this cold night to study a symbiotic relationship that has at its centre a plant called Sweet Bursaria. 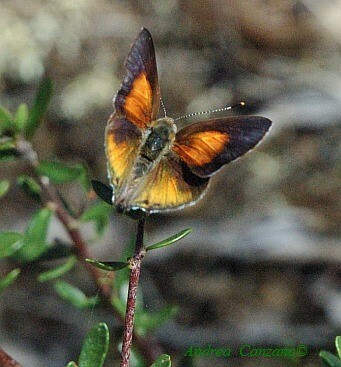 The Eltham Copper Butterfly, Paralucia pyrodiscus lays it eggs under the Sweet Bursaria. Sweet Bursaria (Bursaria spinosa) varies from a graceful 6 m tall small tree in the Geelong Region to a prickly shrub that only grows to 2 m in Central Victoria around Castlemaine and also near Melbourne in Eltham. 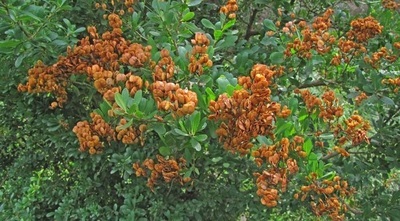 This shrubby form supports the life cycle of the Eltham Copper Butterfly (Paralucia pyrodiscus lucida). The larvae of this colourful butterfly live under Sweet Bursaria bushes in the ant nest of the tiny Notoncus ant (Notoncus ectatommoides). To complete this truly remarkable story, the lively butterflies enjoy a Christmas dinner of sweet nectar from the bursaria's white flowers, pollinating them as they feed. The adult females deposit their eggs on the roots of the Bursaria bush where the Notoncus ant take over duty of care when they hatch. Sadly Sweet Bursaria in all its forms is slowly disappearing from our landscape as are the many insects, including the Notoncus ant and the Eltham Copper Butterfly, that depend on them for their survival. Sweet Bursaria - A story of hope and resilience. ​​There are many interesting yarns that can be told about Sweet Bursaria not the least of which is about its longevity. 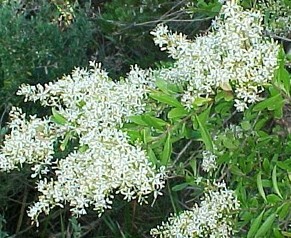 My first introduction to Sweet Bursaria was in a garden near the Melbourne Herbarium some thirty years ago. I asked the resident botanist if he could point out a specimen that was reputedly a tree of note when Captain James Cook reached Australian Shores. I was expecting a very large tree and was surprised to discover that it was only about the size of mature fruit tree, and still looking very healthy over 200 years after Cooks arrival. A tree of similar age can be seen at Como House in Melbourne where historical records describe how it formed beautiful groves on the hill side between the house and the Yarra River. Since then I have seen many ancient Bursaria trees on properties in the Barrabool Hills and the Geelong region and as I discovered with Melboune herbarium tree they are small trees but still remarkably surviving for centuries in our demanding rural landscapes. 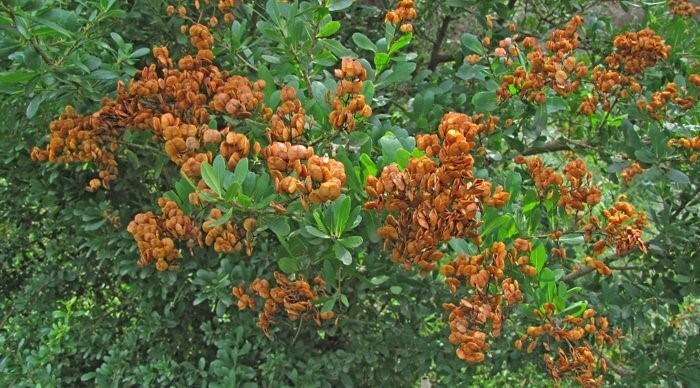 ​One of their common names is 'Christmas Bush' which hints at the summer flowering cycle of the species. Clusters of white flowers make a beautiful display that any gardener would be proud of and of course these honey scented flowers attract insects of all shapes and sizes. One insect of note is the brightly coloured parasitic ichneumon wasp. 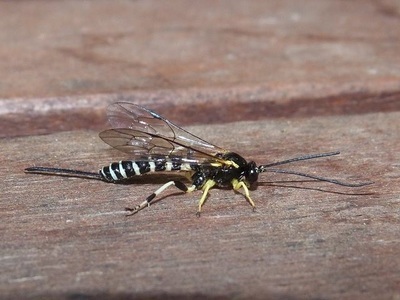 These large wasps pose no threat to humans but are deadly to caterpillars feeding on nearby gum trees. If violence and horrible stories of death and destruction make you squeamish than skip to the next paragraph because the ichneumon wasp uses the long ovipositor at the end of its abdomen to inject eggs into unsuspecting caterpillars. The eggs hatch and devour the caterpillar while it is still living, finally pupating and emerging from its shrivelled host fully formed and ready to fly off to the nearest Sweet Bursaria for a feed of nectar. Sweet Bursaria are tough plants, often growing in dry environments. Locally they are a useful small paddock tree providing shade without competing with pasture or crops. If fenced off to reduce grazing pressure, seeds will blow from the small brown pouches (hence the name bursaria, from 'bursars' the money managers of old who carried their money in a pouch) and new plants germinate shortly after the winter solstice and provide their many benefits to the local environment. Bursarias are quiet workers that definitely deserves our support and we will benefit if we put in the effort to ensure that they survive and prosper. Like the ant, the butterfly and the wasp, we could enter into a symbiotic partnership and do our bit to help nurture the Bursaria so that it survives into the future and provides its many benefits to future generations.